Krypton Ransomware is a new malware infection that is built using the well-known Hidden Tear Ransomware as the base. We have seen several dangerous threats in the past year emerging on the web based on this open-source program, including Satan’s Doom Ransomware and KoreanLocker Ransomware. Somehow it seems that this malicious program is not yet finished but even this version can cause severe devastation on your system if you do not have a recent backup. Although you are offered the decryption software for a few hundred dollars, we do not believe that these villains would send you anything other than another dangerous threat. Our experience indicates that most of the time cyber criminals disappear after you send them money. Please also consider that you would simply support cybercrime, too. We strongly advise you to remove Krypton Ransomware from your system if you would like to restore your system and its operations. One of the possible ways for you to infect your PC with this ransomware is to open an attachment in a spam e-mail. While you may think that you would never even open a spam e-mail, let us tell you that this spam may be very convincing and deceiving. It may, for example, claim that you have not paid for a speeding ticket or parking fine, you gave the wrong credit card information while booking something online, and so on. It is quite possible that such a mail would catch your eyes and curiosity. But you need to remember that it is not possible to delete Krypton Ransomware without losing your files to encryption. This is why it is important for you to be more vigilant when it comes to your mails. You can always send an e-mail to the sender of a questionable mail when you are not sure that it was meant for you. You can also click on the wrong third-party content on a suspicious website and end up on a malicious page armed with Exploit Kits like RIG. If your browsers and Java and Adobe Flash drivers are update, though, such pages cannot really harm you. The reason is simple: These kits can only exploit outdated software versions to drop such infections. So, if you want to protect your computer more effectively, you should always keep all your programs up-to-date. This ransomware program can encrypt all your personal files, including your media files as well as your databases and archives. This would certainly hit anyone hard unless you are a security-minded user who does not keep any important files on his or her machine, but instead uses a removable hard disk to be safe. Here is a list of the extensions this infection targets: ".txt", ".doc", ".docx", ".xls", ".xlsx", ".ppt", ".pptx", ".odt", ".jpg", ".png", ".csv", ".sql", ".mdb", ".sln", ".php", ".asp", ".aspx", ".html", ".xml", ".psd", ".jpeg", ".pdf", ".cs", ".vb", ".gif", ".tiff", ".ai", ".eps", ".indd", ".wpd", ".wks", ".wps", ".rtf", ".tex", ".mp3", ".wav", ".zip", ".rar", ".z7", ".aiff", ".aif", ".avi", ".class", ".java", ".cvs", ".dif", ".fm3", ".fm4", ".midi", ".mid", ".mdb", ".mov", ".qt", ".wkf", ".png". The encrypted files assume a new extension added to the original file name and extension as in "my_photo.jpg.kryptonite". 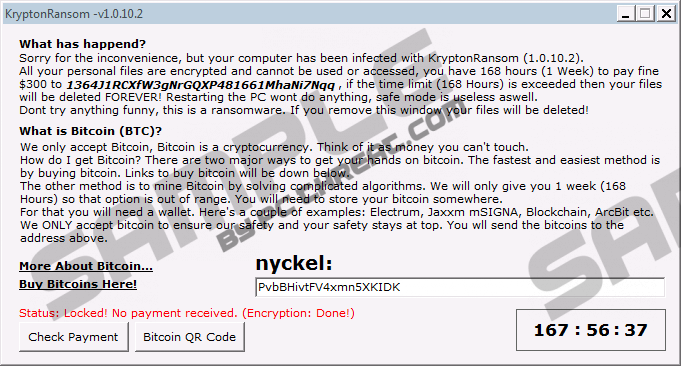 This malware infection makes sure that you do not miss out on the ransom note so it creates a .txt file "KRYPTON_RANSOMWARE.txt" in every folder where files have been encrypted as well as in its folder on your desktop, "test.Krypton". After this infection finishes its malicious operation, it changes your desktop wallpaper with "krypton.png", which is one of the ransom notes. This note informs you about your files having been encrypted and that you need to pay 150 USD's worth of Bitcoins within a week. Then, its application window also comes up on your screen that contains more detailed information about the payment; however, this other note mentions 300 USD in Bitcoins to be paid. So it is not really clear how much these villains want for the decryption software, which they may not even send you anyway. In fact, we advise you to take action right now and remove Krypton Ransomware from your PC. If you have made up your mind and would like to put an end to this danger, here we are with the solution. You can use our step-by-step guide below this article or use a professional malware removal tool, such as SpyHunter. To be frank, an automated security tool can most likely do a more effective job; and, not only by removing Krypton Ransomware but also protecting your PC from future malicious attacks. Download and apply a third-party process explorer to end the malicious process. Bin all suspicious files that you have saved recently (%USERPROFILE%\Desktop, %USERPROFILE%\Downloads, %TEMP% as well as your preferred download folders). Delete the ransom note image ("krypton.png") as well as all ransom note text files. Quick & tested solution for Krypton Ransomware removal.